Growing up, I joined the Cub Scouts with one thing in mind: The Pinewood Derby! While the Cub Scouts offers much more than just the race, it was the main reason I joined the Scouts. I looked forward to building and racing a car all year. The design and building process was my favorite part. The Pinewood Derby is the design collaboration with the Cub Scouts and their parent or guardian, followed by a race to see whose car is the fastest. The rules are fairly simple and certain restrictions are in place to ensure that the playing field is level. The wheels and axels are standardized; there are also weight limits and size restrictions. There are some clever tricks that are legal to give the cars an advantage. The Pinewood Derby is great because it gives kids an opportunity to contrive and test their ideas. The construction process is usually done in home workshops using basic tools to carve out the body of the car. Instead of using basic tools, I decided to implement the latest in design and manufacturing technology to the principle of the Pinewood Derby. The following is my design process. I first created a virtual block of wood to the exact dimensions of the official pinewood derby block. The block was then shaped into a stealthy design using the capabilities of the CAD software, Autodesk Inventor. This initial design is just my idea. It will be interesting to see what the Scouts come up with! Next, I designed some wheels to fit the futuristic look of the car. I composed a 10 spoke star pattern. Many different designs are possible and changes can be made very easily using the CAD software. For the hub, I decided to put my company logo in the center. I added oversized, drilled brake rotors for visual effect and to protect the bearings. I also used a 0.25” axle and high performance wheel bearing that fits into the hub standardizing the wheel assembly. This design parameter will ensure a level playing field the same way the current Pinewood Derby axle and wheel assembly do but with the application of cutting edge technology! Finally I added a rear spoiler for effect and assembled the wheels and axles. This picture is a rendering of what the final model will look like. The overall process of designing the virtual model was pretty quick. 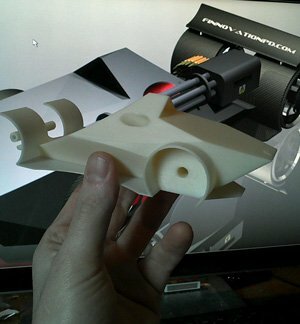 This is the final design of the future Pinewood Derby. The next step is to make this design real. The model took about 4 hours to print on the 3D printer. The detail is exactly the same as the virtual CAD model. It is made of ABS plastic and weighs just 61 grams. Weight can be added later to increase the performance, but for now I need to focus on painting the body and wheels. 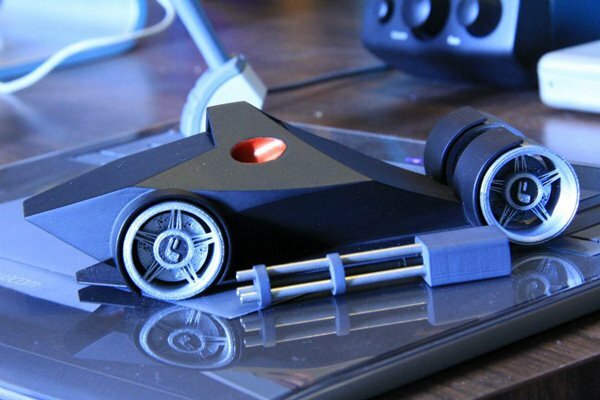 The 3D printed ABS plastic models can be painted and prepared just like in an auto-body shop. After painting, the wheel bearing will be added to the wheel assembly. Then the wheels will be mounted to the body of the car. The final step will be to attach the rear spoiler, but for now the design is ready for wind tunnel testing. This will help with the proper and final placement of the rear spoiler wing. The intent of this project is certainly not to replace the Pinewood Derby, but to expose young designers to the latest in Computer Aided Design and 3D Printing technology. The youth are our future, so why not bring the future to our youth? Finnovation Product Development proposes to select the top 6 Pinewood Derby winners from the Rochester NY area and pit them in the Future Derby! This would involve a top-secret design meeting with the individual Scout and their parent. Their designs will then be produced just like we have produced ours here, right down to their own custom emblems. Designs would be kept top-secret until a public unveiling. Local businesses could sponsor the cars in the form of donations to the Cub Scouts of America. The Scouts will prepare their designs for an extended race on a custom track. HD slow motion cameras will be set up to capture every car, at every moment during the race. Of course, the Scouts will keep the derby cars that they designed and have the opportunity to win 3D printed trophies based on performance. The most important reward for us is to see what young minds will do with cutting edge design technology. Kids are clever, and I have no doubt the results will be amazing. Stay tuned to Finnovation Product Development and keep up with this project!